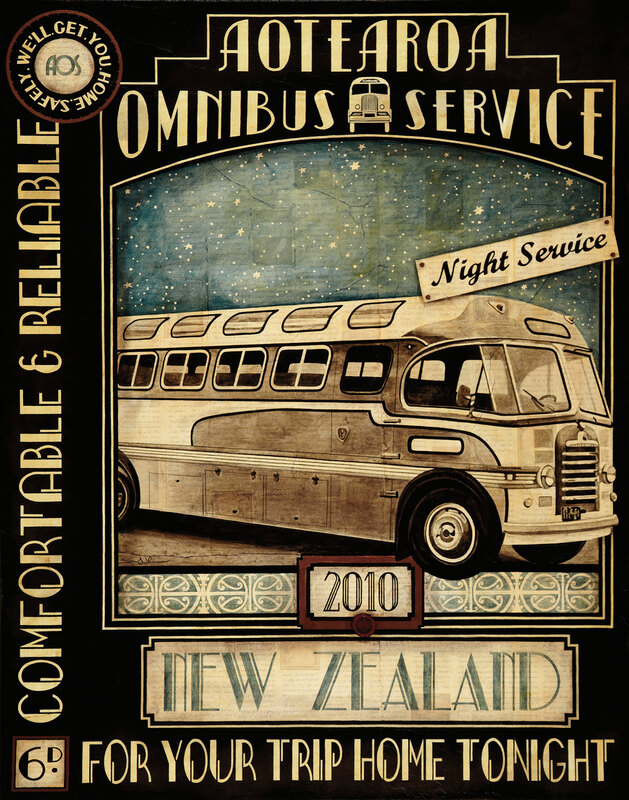 To all the stunning retro and art deco buses that ruled the roads of New Zealand!! Many of which are now house buses, this of course puts a whole new spin on ‘The Journey Home’. Bus: In the 1960s New Zealand Railways Road Services ran a large number of Bedford SB3s with New Zealand Motor Bodies’ Omnicoach bodywork – like the one in this painting. Boarder design: The boarder is based on the Eastbourne Borough Council Omnibus Service Garage which is based at the Southern end of Eastbourne (Wellington) at Burdens gate. Kowhaiwhai (scroll design): A combination of rautawa (tawa Leaf) and ngutu kaka (kakabeak). The words: I have employed words that people associate with an ideal way to travel… Affordable and Efficient, Comfortable and Reliable. 6d – 6 pence, the very affordable price for that reliable transport home at night. We’ll get you home safely – Safety…an important part of travel. Note: Title of the painting: I was going to use the word wheel in place of we’ll in the logo design, however when naming the painting I couldn’t resist!